Boca Reservoir just received 2,000 pounds of Rainbow Trout today. 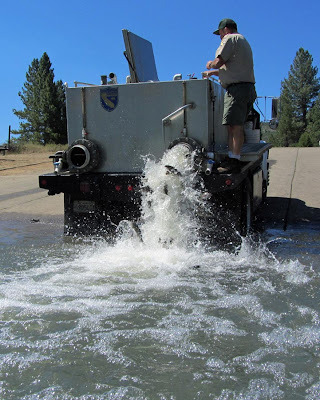 The Fish and Game hatchery truck unloaded the half pound,13 inch fish at the boat ramp on the west shore. The truck driver told me another load of trout would be delivered in a few days. As the tanks were unloaded, the fish went wild. They jumped out of the water, beached themselves, and thumped against my kayak. Within 10 minutes we got all of the beached fish back in the lake, where they disappeared with their buddies.